What can affect your resting metabolic rate? RMR calculator is a tool which can provide you an answer to the question "how many calories do I burn at rest?" Insert a few basic parameters and find your resting metabolic rate value. In the article below, you will find detailed information about what is RMR, resting calories, a comparison BMR vs RMR, and how to use the calculator. Don't hesitate to check it! The resting metabolic rate calculator estimates the amount of calories used by your organism to keep it alive (in rest time). Calculations base on a modified Harris-Benedict formula. This modification allowes to sum calories that are burned during food digestion. Digestion increases your basal metabolic rate by 5-10%. For example, if you eat 1800 calories one day, about 90-180 of them will be used for digesting, absorbing, and storing meal nutrients. RMR does not account for calories burned to support physical activity. Anything that we do through a day requires energy (calories) to be burned in addition to those used to support resting metabolic rate. Besides RMR, there is also a term basal metabolic rate (BMR). This is something different than resting metabolic rate. It doesn't take into account calories utilized for food digestion. That's the reason why RMR is considered to be more reliable in the estimation of resting calories. Your body is usually digesting some amount of food at every moment of time. To perform a basal metabolic rate measurement (in the laboratory environment), you need to fast at least 12 hours (where for RMR it is not required at all). We will find how to use the calculator by investigating the example below. We assumed some parameters for our average person. 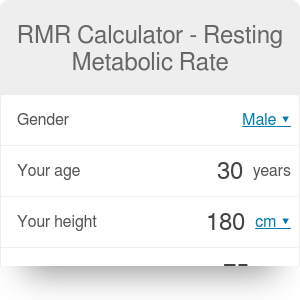 RMR Calculator - Resting Metabolic Rate can be embedded on your website to enrich the content you wrote and make it easier for your visitors to understand your message.